We deliver fun for all occasions. Backyard party, birthday party, school festival, church festival, day care center, day camp program, company party or special events. We have the right jumper for the occassion. Simply call Tumble n Jump Inflatables to make your reservation and make your party the best ever!! 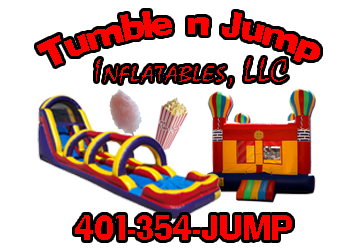 Tumble n Jump Inflatables is located in Cranston, Rhode Island and serves Rhode Island, Massachusetts and the surrounding areas. In Rhode Island, they are known by many names: jumpers, fun jumps, bounce house, moonwalks, bouncers or even a kid’s party inflatable thing. We have a great selection with all of your favorite characters. We also have inflatable slides, water slides, and concessions including: Popcorn,Sno Kone,and Cotton Candy Machines. So if you need a jumper rental in Rhode Island and Massachusetts, just give us a call or reserve on-line. We deliver and Set up our jumps. Jumpers are cleaned and sanitized after every rental. We have party planning experience and we deliver throughout Rhode Island. For a kids party they won´t soon forget, get a Tumble n Jump Inflatable (or moonwalk, bounce house, fun jump or a jumper or whatever you want to call it) from us and we promise a fantastic time. Note: We´re birthday party specialists with castles, jumps, slides and more but don´t forget the big kids too.